With an estimated 35 million stray dogs roaming the streets of India, the fate of a single dog might seem trivial to some - but not for the dedicated rescue volunteers from Animal Aid Unlimited. The volunteer organization, based in the city of Udaipur, recently spent hours to save the life of a dog who had found himself in what looked an awful lot like a hopeless predicament. "He had fallen into a pool of hot tar that smothered his body and had become rock-solid," writes the group. "He was stuck to the ground and unable to move. A passerby saw him struggling and called our help-line." Volunteers were dispatched to help the desperate animal, who appeared to be struggling to breathe. 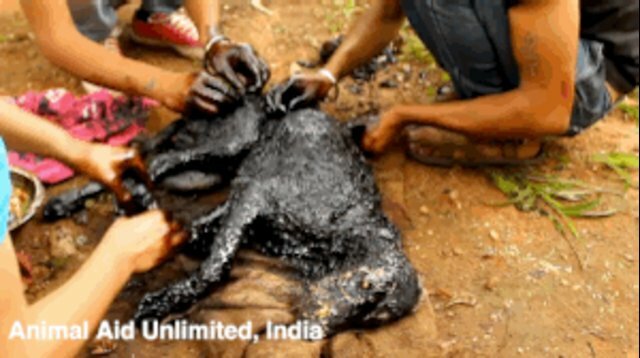 The team applied vegetable oil to soften the hardened tar, carefully removing the sticky black substance from the dog's fur, clump by clump. Slowly but surely, the exhausted dog was freed from the encasing tar. Animal Aid Unlimited reports that the entire cleaning process took three long hours, spread over two days. 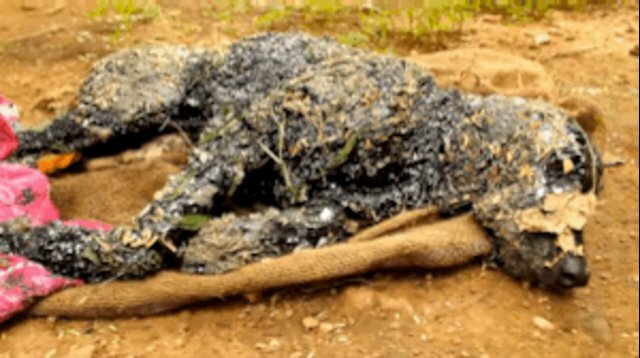 By the time all the tar had been removed, the dog was virtually unrecognizable. Every year, Animal Aid Unlimited volunteers help save thousands of stray animals who, like the dog in this remarkable rescue, would likely perish without the intervention. To learn more about the group, and to find out how you can get involved, visit their website here.